Situated near Perumbavoor in Ernakulam, Iringole Kavu is a gorgeous destination which you would love to go to for a walk, especially in the monsoon. 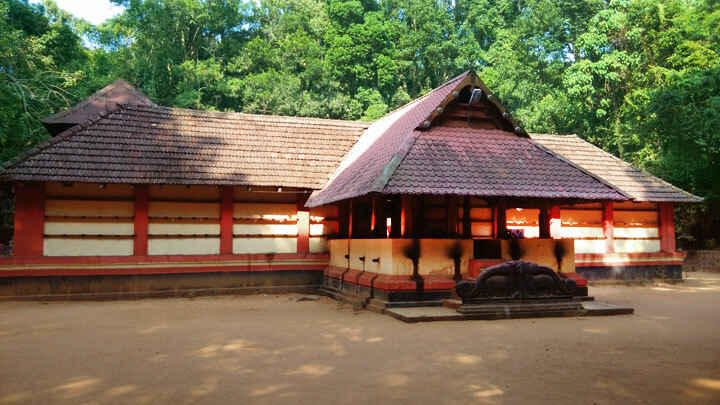 Like most sacred groves, Iringole Kavu, too, has a temple which is dedicated to Mother Goddess. 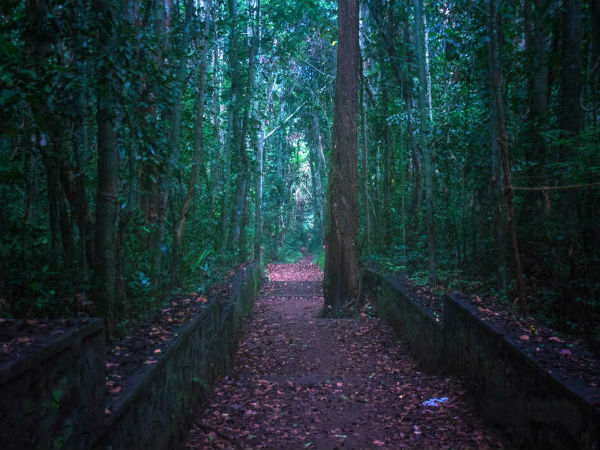 Considered as one of the largest sacred groves or kavus in Kerala, when you visit the place, you can hear the droplets of rain making its way down through the green canopy; all of this is accompanied by the chirping of birds and chattering of squirrels, which would give you an energetic experience of being in a tropical forest, although, this one is not legally considered as one. The temple is said to be 2700 odd years old, but only 1200 odd years old since the rituals and festivals and the arrival of devotees began. Spread over 50 odd acres of land, it would take one an entire day to cover the entire sacred grove. The grove remains in the multiple hues of green with its many marshes and ponds in the vicinity, which form a mesh like appearance in the ground formed by the locks of roots which have aged up to thousands of years. The temple pond here is filled with water throughout the year, which means to say even during peak summers. The grove is not only the holy abode of Mother Goddess but also to 49 odd different species of trees, 19 varieties of spiders, four species of amphibians and seven species of reptiles. While most of its residents are under the threat of extinction, it is also home to 42 different species of insects and 5 mammals. The green woods surrounding the temple exhibit a very rare combination of divinity and wilderness. The devotees consider the huge trees, whose roots spread out in all possible directions, to be various gods, who sing and chant hymns and prayers in honour of the goddess. Due to this reason, the place is well protected and not even a single stick is removed from the vicinity which is filled with a wide range of flora and fauna. As per one of the many stories, which are associated with the goddess here, the most popular one goes like this, the goddess is considered as the eighth born child of Devaki and Vasudeva who ever imprisoned by Kamsa. It is said that the newborn rose up to take the form of goddess Durga. Kamsa attempted to kill the infant and the goddess made her appearance with a lighting; the place where the lighting struck was called Irunnol, which later became Iringol. Another legend narrates that, a sage named Trinabindu had been meditating here. Once Hanuman is said to have watched him without his knowledge. Pretty soon the monkey god was chased away by the sage who failed to recognise him. Hanuman is believed to have returned with an elephant and a lion, which further enraged the sage who cursed Hanuman, who happened to sitting atop a tree, that he would be unaware of his strength. Hanuman's father, the wind god, is said to have searched the entire forest after learning about the curse and began to shake every single tree here. Except one, the rest trembled to the power of Vayu. The monkey god had been sitting on this tree which came to be known as Valiya llavu and is one of the most worshipped ones here. It also said that Vayu bowed before the sage to apologise on behalf of his son, but he was stubborn. The sage reminded Vayu that Iringol is a sacred land; the wind which blows here must be soft and no one should cut the trees and that there will be no dangerous animals or venomous ones which would harm anyone. Here, Mother Goddess is worshiped as Saraswathi, the goddess of learning, in the morning, Vanadurga in the afternoon and as Bhadrakali in the evening. Here only tulasi or the holy basil and non-fragrant flowers, such as the lotus, are used for the rituals, which makes it all the more unique. The entry to the temple is strictly for those who practice Hinduism and if you happen to carry any sort of plastic material, kindly refrain from dumping it into the groves and be watchful for snakes.